Small businesses are often not associated with manufacturing. However, in the US small manufacturers can be found in all fifty states. Organizations such as the American Small Manufacturers Coalition (ASMC) exist to promote small manufacturers and to lobby the government to assist with legislation and federal programs. Small manufacturers can offer specialized and personalized products that larger manufacturers cannot make profitably. Niche manufacturing by small manufacturers allows them to operate in areas that have little or no competition from larger companies. Owning a small manufacturing company does not necessarily mean that you need to be experienced in all aspects of the process, for example, sales, shipping, procurement, and exporting. There are many businesses that offer professional services that can assist in accounting, marketing, purchasing, exporting, etc. The availability of business software and internet services allows the small business owner to use the same business processes that are used at larger companies. This allows the small manufacturer to concentrate on the production of quality items that are required by their customers. When small businesses are involved in manufacturing, there are a number of manufacturing methods that are employed. These are flexible, continuous, intermittent and custom manufacturing. This type of manufacturing is extremely suitable for the small manufacturer. Flexible manufacturing uses equipment that is controlled by a number of Computer Numerical Control (CNC) computers. The production relies more on robotic cells than manufacturing personnel which allows the business owner to change the products manufactured to react to customer or market needs. The use of automation produces a product that is manufactured to precise specifications which in turn improves the quality of the product. The only disadvantage of this type of manufacturing is the high initial cost of the manufacturing equipment. When small businesses manufacturer a single product, then continuous manufacturing is a method that can be employed. 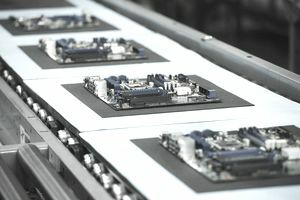 The process is basically an assembly line that produces a single finished product rather than a number of products or products made specifically for a customer order. The assembly line can be made up of a number of workstations or work centers where individual operations are made on the product as it passes along the line. This manufacturing method is ideal for small businesses that do not manufacture items that are customizable. This allows every finished good that is produced to be sold to any customer without modification. If a small business is going to manufacturer products that are of a similar type, they can adopt an intermittent manufacturing method. Businesses that manufacture items that are similar in nature, but have variations, are suitable for intermittent manufacturing. For example, a company that only manufactures tires for bicycles will sell tires that are of different sizes to fit a variety of bicycle wheels. Businesses will manufacture batches of the same product depending on demand and then will manufacture a batch of the same or another product. This type of manufacturing is good for products, which are based on fluctuating demand. Custom manufacturing is a method used by a large number of small businesses. This method allows business owners to fully customize their finished product to the requirements of the customer. Many items can only be manufactured in this method due to their complexity or the skills required in manufacture cannot be replicated by a machine. Small business owners that work alone often specialize in items that are made using custom manufacturing. Manufacturing is not limited only to large businesses; thousands of small businesses manufacture items that are used by customers across the world. Small manufacturing businesses can be very successful when they offer items that are niche products where they have very few competitors. Small business owners should remember that they do not have to know every aspect of running a business and can use professional services such as accounting, marketing, and technology companies to gain a competitive advantage.